I have been putting it off, but the time has finally come. I am pinching my nose and plunging head first into a towering wave of cards. That’s right, it’s time to do some editing. 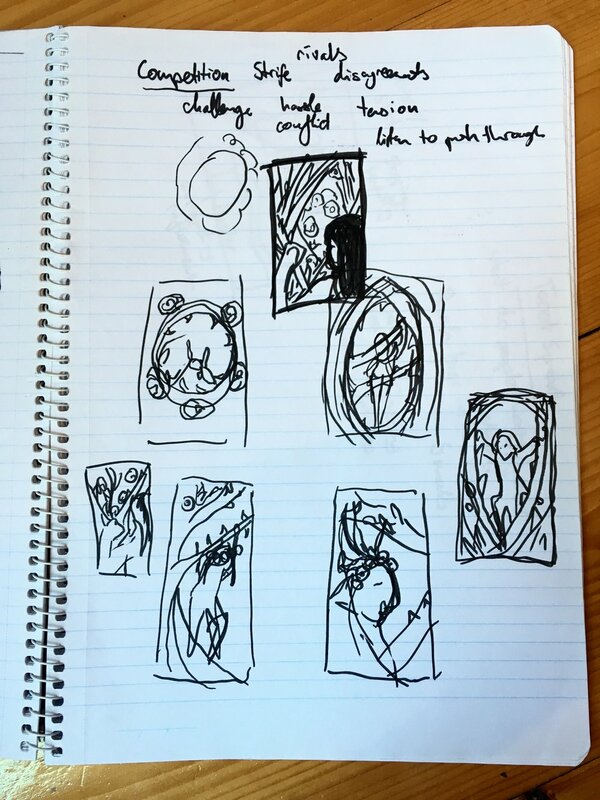 If you have been following me on Instagram, there’s a chance you had to endure months of the awkward, grainy illustrations that marked the beginning of my tarot card project. The graininess can be credited toward my dedication to drawing each card in ink. Sure, they looked great in person, but their charmingly rough edges translated into sloppiness on screen and in print. And so, I have started the laborious process of tracing these old cards digitally to bring them up to spec with the rest of the deck. Since I am spending so much time reflecting on each card as I go, I thought this would be a good chance to write about the process of conceptualising and drawing each image, starting with the Five of Wands. Notebook of a madwoman. Don't worry, I can't read my writing either. The final image for the Five of Wands is one of my favourites in the entire Blind Tarot, but it was a struggle to get it to that point. Pretty appropriate considering this card is all about conflicts and challenges. I knew from the get-go that I wanted to represent these challenges with rose bushes. The rose has always been one of my favourite plants to draw, not only for the intricacy of its flowers, but for the curious juxtaposition of soft petals and sharp thorns. It is the perfect plant to represent the sweet rewards that can come if you are persistent in pushing through times of strife. I have always tried to keep an element of hope in the more negative tarot cards, and a reward of flowers ticked that box for me. In my thumbnail composition sketches above, you can see that I was working on images of women pushing through the thorns— you might have to squint and use your imagination a little. The topmost thumbnail is the composition I eventually selected. As you have probably guessed, I didn’t stick to that image. I liked that version of the Five of Wands, but got completely carried away with my shading and the whole thing was a bit wishy-washy. Had I been illustrating digitally at the time, I probably would have persisted with it and missed out on discovering a better composition. As it was, I put the card aside and did not return to it for a month or so. On my second attempt, I focused on stripping back all of the elements that had muddied the original design. I lost the shading and let myself play with fantastical, surreal imagery instead. The second version ended up changing my approach to the entire deck, but there were a few extra steps to get to the third and final version of the card. I brought a photo of the second version into my illustration program and faithfully traced over the card. Once I had an almost-identical digital twin, I let myself tweak and edit it to my heart’s content. There is no way to describe how satisfying it was to amend all of those little mistakes that have been bugging me for the last eight months. Though I edited the cards in part for my own sanity, it was also necessary to make the whole deck more cohesive. My art style has changed so much over the last year that my older cards would look out of place amongst my more recent ones without making a few adjustments, such as changing the shading levels and techniques. This was definitely one of the easier cards to edit. There are many more that will require huge changes or to be entirely redrawn from scratch. But, hey, one card down. Just don’t ask me to count how many are left.